For a small, inconspicuous and largely nocturnal animal, the crested newt attracts considerable attention. Scientists from many countries have spent decades in the field tracking the ups and downs of crested newt populations. Thanks to these efforts, we know that crested newts can live up to 17 years in the wild, and travel over 1 km within a few weeks. We also now understand more about why crested newts are restricted to certain types of ponds. Legislators have awarded crested newts a very high level of protection. As a consequence, governments are required to establish nature reserves for them, and to monitor their status. People reminisce about childhood memories catching crested newts in local ponds, and speculate about why they are no longer so abundant. Many who have peered into ponds in spring have been entranced by their elaborate courtship dance. Developers, on the other hand, express frustration at encountering crested newts on land they have acquired for new housing, once they realise the potential financial implications of destroying crested newt habitats. This book draws together research and observations on the six species of crested newt across their range. It examines their taxonomy, biology, ecology and behaviour. 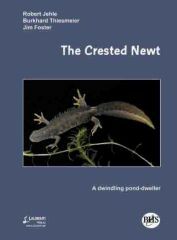 Incorporating the latest research, the book also contains sections of special relevance to the great crested newt in the UK, with a focus on conservation and management. We hope that the book will assist the conservation of crested newts – which are experiencing declines in many areas – by providing an up to date overview of our knowledge about these species. in polnisch mit engl. Zusammenfassung, Br, 15 x 21 cm, 169 S.